“Glass” is directed by M. Night Shyamalan and is the follow up to his films “Unbreakable” and “Split”. “Glass” is one of those films where you need to have seen the first two films before it, to really have an idea of what is going on, so I will be getting into some spoilers for “Unbreakable” and “Split” for this review, and if you have not seen “Unbreakable” or “Split”, I really recommend them becuase they are also great films on there own. “Glass” is something that alot of people have been waiting for, which is a sequel to “Unbreakable”, when “Split” came out in 2016, the twist at the end of that film was that it was actually set in the “Unbreakable” universe and everyone including me went nuts. After that M. Night finally revealed that he has been working on an “Unbreakable” sequel called “Glass”, that would not only bring back Samuel L. Jackson and Bruce Willis, but will also have the new characters from “Split” joining them. I am a big fan of the first two films especially “Unbreakable” with it being one of my favorites of all time, so I was looking forward to this film and I really enjoyed “Glass”. The cast did pretty well, it was awesome to see Bruce Willis and Samuel L. Jackson come back to play these iconic characters, I really enjoyed seeing Spencer Treat Clark from “Unbreakable” return too, but James McAvoy steals the show. The way McAvoy is able change his personality and whole body language in an instant, like a snap is just incredible to me. I’ve been seeing alot of reviews saying this film is talky and boring and yes, it does have alot of dialogue scenes, but I was never really bored and I was interested the whole time. Also I can see where people are saying the ending is a bit of a letdown, I thought it did go over the top at some points, but it didn’t really take me out of the film, I think it’s one of those endings that, you will either not mind it or not care for it. Of course, it’s not a Shyamalan film with out some twists, I’m not going to spoil them, but I will say, one of the twists I absolutely loved and the other one didn’t really do anything for me. 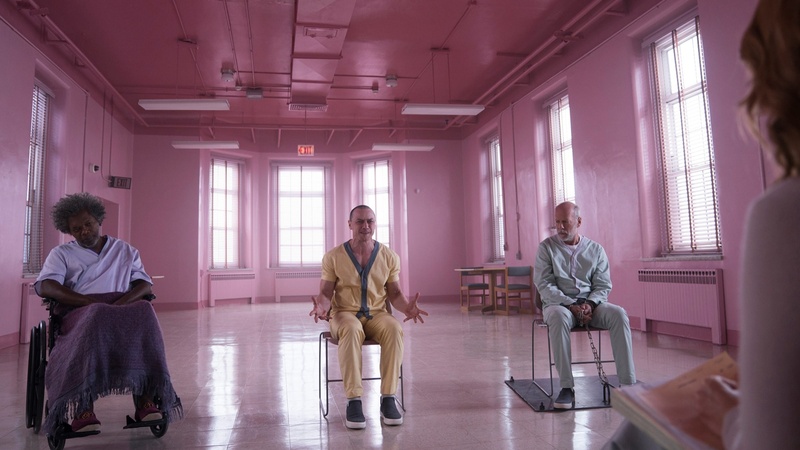 Overall, I enjoyed “Glass” alot and will probably be seeing, is it perfect, no, it does have problems, but as an ending to a trilogy, I think M. Night Shyamalan has given us a very solid conclusion.